"Rickman School was first established in 1917-18 in a one room school with Mr. I.E. York as teacher. The school was located in a field on Mr. Clyde Bilbrey's farm. The land was then owned by Mr. Bilbrey's grandfather and was deeded to the county to be used for school purposes. A second room was added two or three years later. School lasted three months at first, then five months, with a subscription-type school in the winter." "In 1925-26, the first high school was started in the old Methodist Church. There were 12 students enrolled. Mr. Stanley Carr was a teacher-principal there. Then, in 1928, four acres was purchased from Mr. Walter Oakley for $125.00, and the new school was built where the present one now stands. The following men donated $25.00 each for the purchase of the property: Doc Bilbrey; J.B. Hastings; Bob Bilbrey; and Walter Oakley. The remaining $25.00 was donated by the Oakley family. The new brick building was erected in 1928, and the first graduating class was in 1931. The school consisted of six classrooms and a study hall-auditorium combination. Mr. Carr was still principal at that time." "In the 1930's, two frame buildings were donated to be used as a lunchroom and a classroom The first gym was built in the fall of 1933, with money donated by interested citizens. The supervision of the building was done by Glen Kelly. Free labor was donated by school boys and men of the community." Pictured here is the sophomore class at Rickman School taken in 1929. 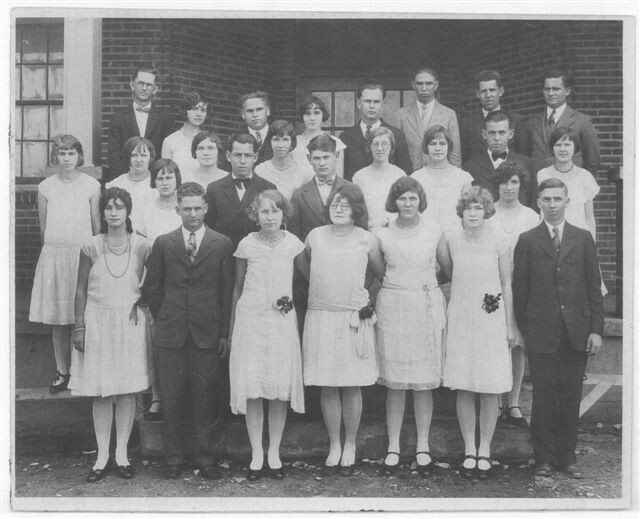 This group went on to become the first graduating class of Rickman High School in 1931. First row: Myrtle Carr Stewart; Claude Andrews; Alma Qualls Andrews; Leika Williams Boatman; Meikle Bilbrey; Catherine Wilmoth Bilbrey; Horace Curtis. Second row: Nell Thompson Mainord; Raymond McCormick; Millard Harris. Third row: Bertha Brown Huckeby; Bertha Webb Morris; Auda Wilmoth Ford; Flossie Bilbrey Wilmoth; Audie Maynord Jones; Jessie Lee Qualls; Aubrey McCormick; Lizzie Thompson Norrod. Fourth row: Emmerson Hinds, teacher; Naomi Boles Roberson; Otha Qualls; Ruth West Qualls; Marson Wilmoth; Burch Bilbrey; Carson Harris; Stanley Carr, teacher. "The school burned in the spring of 1950. Classes were held in churches, on buses, in the old gym, and in the lunchroom which did not burn. The school was rebuilt that summer and fall. The restrooms were not finished until the next year, so the old outside toilets of the old school were still in use for some time." "Many noted events have changed the face of the Rickman campus since 1950. In 1956, the old gym was torn down, and the current one was built. The foundation of the old gym was blacktopped and several generations have played games, including basketball, on its surface over the years. In 1967, the lobby of the new gym burned. The fire apparently started from the popcorn machine. The basketball teams had to practice at neighboring schools the remainder of that year because it was not remodeled until that summer." "A new lunchroom was built and served the first lunches on February 11, 1966. In 1967, the old lunchroom, located in the basement, was converted into two kindergarten rooms." "The 1970's saw even further changes. Three mobile units were added as classrooms. In 1974, a new addition was added to the front of the school. It contained four regular classrooms, a new biology lecture room and adjoining lab, a clinic, counseling office, conference room, teachers' work area, and the office. The old auditorium was remodeled into a new library containing a work room and media center. In 1977, the east end of the gym was reconstructed to add a new stage with two coaches offices at the sides. In 1978, approximately 40 acres of adjoining land was purchased for the school's expansion." "The consolidation of the high schools of Overton County in 1985 saw the close of an era of much pride and love for the Rickman school. Rickman graduates still have a lot of loyalty and love for their old alma mater and still meet on the Saturday night before Easter to reminisce and reacquaint themselves with their old classmates and former teachers." Mrs. Eva Lee Finley served as librarian at Rickman School for 26 years. Prior to becoming librarian, she taught for twelve years in one teacher schools that included Thorn Gap, Pond Ridge, Tin Top, Flat Rock, Thompson's Flat, and Fish Pond. Mrs. Finley began her teaching career at age 18. Her salary then was $50.00 per month. One year, the school system ran out of money, and because of her devotion to her students, she volunteered to teach for free the rest of that year. Classes in one teacher schools were held for eight months, and would often consist of 35 to 38 students. Amy Gore and Eva Lee Finley are shown here looking over the many cards and letters written to Mrs. Finley honoring her 26 years of dedicated service as librarian at Rickman school. Amy Gore is the present librarian there. In 1951, the small, one teacher schools in the outlying area around the Rickman community were consolidated with the Rickman school. In order to become a certified librarian, it was necessary for Mrs. Finley to complete 27 hours which she did in Murfreesboro. When she began her career as librarian at Rickman, there were hardly any library books available for students other than a set or two of reference books and some much used text books. There were no children's books at all. Mrs. Finley worked diligently to get better books that would meet with state approval, something that was necessary then. Books such as Harry Potter that are popular today would never have been found in a school library during the years Mrs. Finley served. The state guidelines were very strict then. One of the things that took a very long time to do after Mrs. Finley began as librarian was the setting up a card system for checking books in and out of the library. Something called the Dewey Decimal system was used. There were ten categories in this system. Each book was placed in one of those ten categories and was then given a number. All cards for this system were made by hand, and this was during a time when no money was set aside to help establish a library. That’s where the good folks of the Rickman community came to the rescue. Mrs. Finley spoke very highly of the support and financial aid the Parent-Teacher Organization as well as the community as a whole provided during the years she served. Whatever the community was called upon to do for the school, they did their best to see that it was provided. Mrs. Finley described the students and parents she came in contact with during her teaching career as being the most wonderful people she could possibly have had. She also told me that she was sometimes called upon to be what she referred to as a peace maker. On one occasion, Mr. G.P. Frasier, who served as principal at Rickman for a number of years, asked Mrs. Finley to go visit with a senior boy who had gotten upset with teacher and decided just to quit school. Appreciative of the confidence Mr. Frasier placed in her, she was still very concerned that she might not be able to talk this young man into coming back. But after a lengthy visit in his home with his entire family present, the young man was back the next day. Thanks to Mrs. Finley's visit and words of encouragement, he did go on to graduate that year. On November 18, 2006, Mrs. Finley celebrated her 90th birthday. To honor her years of dedicated service and to commemorate her birthday, Donnie Holman, assistant principal at Rickman school, suggested that books be purchased in honor of Mrs. Finley. For each book purchased for the library, a letter was written to Mrs. Finley by the person donating the book. Those donating were either former students, friends or members of Mrs. Finley's church. 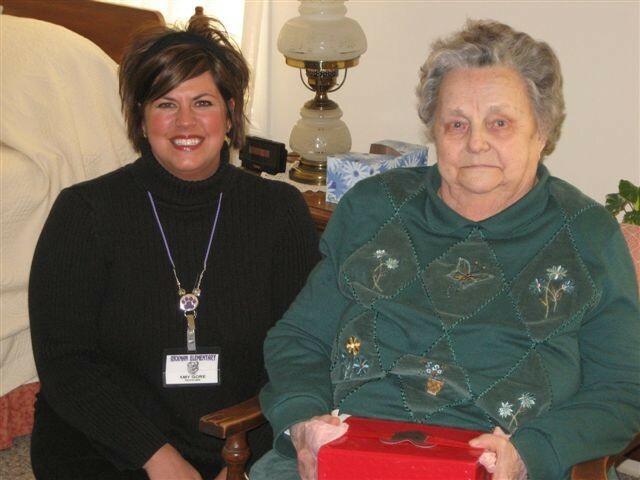 Mrs. Finley is now a resident at Cedar Hills Retirement Center in Cookeville. Should there be someone who might want to visit or write to Mrs. Finley, her address is 1250 Cedar Hills Drive, Cookeville, TN 38506. Those who have served as past principals are: Estelle Daniel; Frazier Harris; R.T. Little; Stanley Carr; Clyde McDonald; C.H. Bean; Evie Tucker; Ralph Prather; Stanley Carr; G.P. Frasier; Kenneth Dodson; James Harris; Rusty Linder; and Kevin Rhoton. Marsha L. Wyatt is currently the principal. Donnie Holman and Shane Qualls are both vice-principals. Donnie Holman had this to say about the present day students, staff, and the people of the Rickman community: "In my opinion, the one thing that sets Rickman Elementary apart from many others is its tremendous school pride, both within the school and community. I have also heard over the years that Mr. Frasier had a statement that he made quite often at his faculty meetings. Mr. Frasier has stated, ‘The very best that we can do is not good enough for the students at Rickman School.’ I feel like the faculty at Rickman Elementary still feel that way. We want only the best for our students, and we are willing to do whatever it takes to provide that for them." The past eighty years have certainly seen a lot of changes in the Rickman school system. Beginning with a one room school with 12 students, the enrollment today boasts 675 students. The same spirit that began when the community came together to donate $125.00 for land on which to build a new school continues on today through the students, the teaching staff, and the citizens of Rickman who can proudly say their community has one of Overton County’s finest learning facilities.